What’s driving historic spending in downtown Salt Lake City? Restaurants, bars and one big theater. 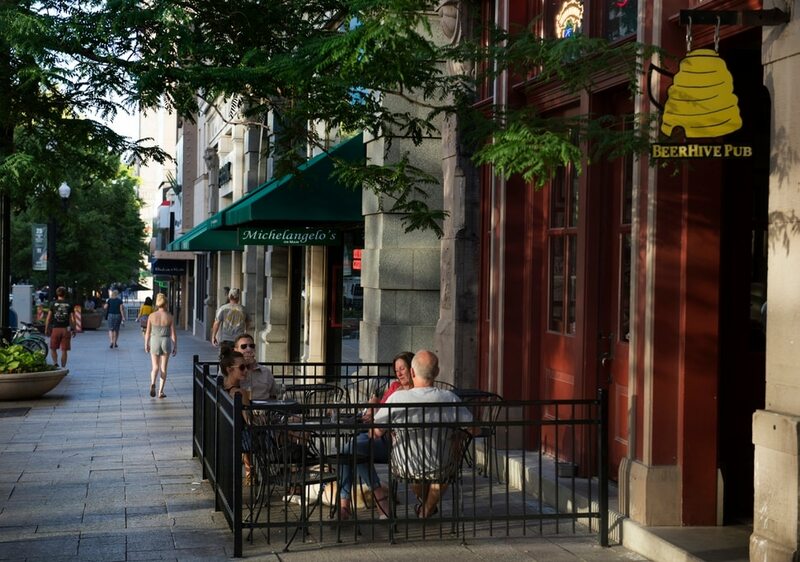 (Rick Egan | The Salt Lake Tribune) In downtown Salt Lake City in 2017 sales tax receipts for hospitality industries, restaurants and bars, exceeded those for retail, meaning folks are coming downtown more for nightlife than for shopping. Tuesday, June 26, 2018. (Rick Egan | The Salt Lake Tribune) In downtown Salt Lake City in 2017 sales tax receipts for hospitality industries, restaurants and bars, exceeded those for retail, meaning folks are coming downtown more for nightlife than for shopping. Tuesday, June 26, 2018. (Rick Egan | The Salt Lake Tribune) In downtown Salt Lake City in 2017 sales tax receipts for hospitality industries, restaurants and bars, exceeded those for retail, meaning folks are coming downtown more for nightlife than for shopping. Tuesday, June 26, 2018. (Rick Egan | The Salt Lake Tribune) In downtown Salt Lake City in 2017 sales tax receipts for hospitality industries, restaurants and bars, exceeded those for retail, meaning folks are coming downtown more for nightlife than for shopping. Tuesday, June 26, 2018. (Rick Egan | The Salt Lake Tribune) In downtown Salt Lake City in 2017 sales tax receipts for hospitality industries, restaurants and bars, exceeded those for retail, meaning folks are coming downtown more for nightlife than for shopping. Tuesday, June 26, 2018. (Rick Egan | The Salt Lake Tribune) In downtown Salt Lake City in 2017 sales tax receipts for hospitality industries, restaurants and bars, exceeded those for retail, meaning folks are coming downtown more for nightlife than for shopping. Tuesday, June 26, 2018. (Rick Egan | The Salt Lake Tribune) In downtown Salt Lake City in 2017 sales tax receipts for hospitality industries, restaurants and bars, exceeded those for retail, meaning folks are coming downtown more for nightlife than for shopping. Tuesday, June 26, 2018. (Rick Egan | The Salt Lake Tribune) In downtown Salt Lake City in 2017 sales tax receipts for hospitality industries, restaurants and bars, exceeded those for retail, meaning folks are coming downtown more for nightlife than for shopping. Tuesday, June 26, 2018. (Rick Egan | The Salt Lake Tribune) In downtown Salt Lake City in 2017 sales tax receipts for hospitality industries, restaurants and bars, exceeded those for retail, meaning folks are coming downtown more for nightlife than for shopping. Tuesday, June 26, 2018. (Rick Egan | The Salt Lake Tribune) In downtown Salt Lake City in 2017 sales tax receipts for hospitality industries, restaurants and bars, exceeded those for retail, meaning folks are coming downtown more for nightlife than for shopping. Tuesday, June 26, 2018. (Rick Egan | The Salt Lake Tribune) In downtown Salt Lake City in 2017 sales tax receipts for hospitality industries, restaurants and bars, exceeded those for retail, meaning folks are coming downtown more for nightlife than for shopping. Tuesday, June 26, 2018. (Rick Egan | The Salt Lake Tribune) In downtown Salt Lake City in 2017 sales tax receipts for hospitality industries, restaurants and bars, exceeded those for retail, meaning folks are coming downtown more for nightlife than for shopping. Tuesday, June 26, 2018. Downtown Salt Lake City appears to be evolving into more of a nightlife and entertainment hub, judging from key shifts in sales revenues for 2017. At the same time, even as new apartment and office projects come online, there is an unmet demand for office space and housing, officials said Tuesday. And that has started to hamper efforts to recruit new employers to Utah’s urban core — though downtown continues to break economic records. The city center’s two main ZIP codes, 84101 and 84111, saw an all-time high of $865.4 million in retail sales last year, after a year-over-year dip in 2016 to $837 million, according to data from the Utah State Tax Commission. Those and other trends were highlighted in the joint release Tuesday of the yearly Downtown Economic Benchmark report along with a survey of regional perceptions of downtown Salt Lake City. Downtown still runs on a shopping and restaurant-based economy, of course. But for 2017, nearly 44 percent of its sales receipts — or $388.7 million — came from eating and drinking establishments, which put that category ahead of traditional big earners such as apparel shopping, sales at department stores and other retail sales. Entertainment is changing downtown as well, led by the 2,468-seat George S. and Dolores Doré Eccles Theater on downtown Main Street. Polls released Tuesday show the Broadway-scale theater, which opened in 2016, now narrowly outstrips the Mormon Tabernacle Choir as the main reason people visit downtown for fun. On top of their day-to-day economic impact, entertainment and dining also represent the direction of future growth for the urban core, according to Jason Mathis, executive director of the Downtown Alliance. “They really are the trends driving the decision for people to live downtown or to have their office downtown,” Mathis said. He added that poll numbers show a solid quarter of Utah residents statewide are interested in living in the city center. A majority of those would-be downtown residents were young people. But there is a housing shortage, downtown as well as across Salt Lake County and statewide. Twice as many residents complain about housing affordability now as four years ago, surveys show. And even with as many as 35 housing projects planned, being built or recently completed in the urban core — expected to bring online more than 4,500 new apartments — thousands more dwellings are needed, ranging from luxury, market rate and workforce housing to middle- and low-income units. “At all levels, we need housing built in the downtown area,” Mathis said. Ben Kolendar, Salt Lake City’s deputy director of economic development, said the lack of office space had led some key businesses considering relocation to bypass Utah’s capital in the past year. According to Patrick Bodnar, senior associate with the real estate firm CBRE, the rapid pace at which new dwellings are snapped up downtown also indicates fierce competition among developers, especially in Salt Lake City’s top-end, luxury housing market. Bodnar said a significant portion of that demand is driven by out-of-state professionals drawn to new financial and technology jobs in Utah, often relocating from other urban areas. Downtown currently offers about 11.9 million square feet of office space, but there is a lack of available large blocks of 50,000 square feet or more, said Nadia Letey, vice president over advisory and transaction services with CBRE. Market demand has sparked interest in converting historic properties into modern office spaces downtown, Letey said, as well as a rise in coworking centers that allow small businesses and startups to share space and office support costs. Correction: Ben Kolendar, Salt Lake City’s deputy director of economic development, said that a lack of office space had led some relocating businesses to bypass Utah’s capital. A prior version of this story misstated his quote.